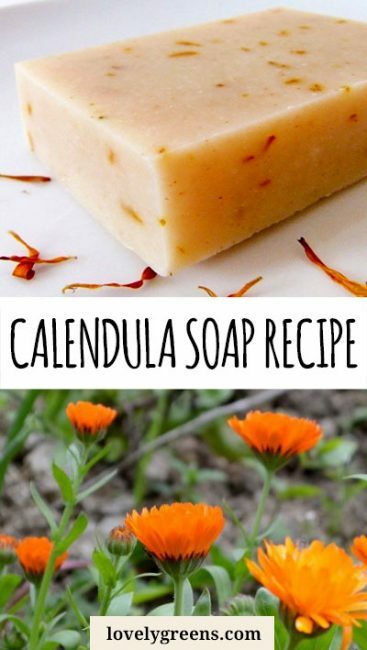 There are a few ways that you could make calendula soap. First off, you can choose to use either fresh or dried flower petals. When using fresh petals, it helps to chop them finely using a knife or immersion blender. Larger pieces of petal might not preserve well and could cause mold or rancidity. 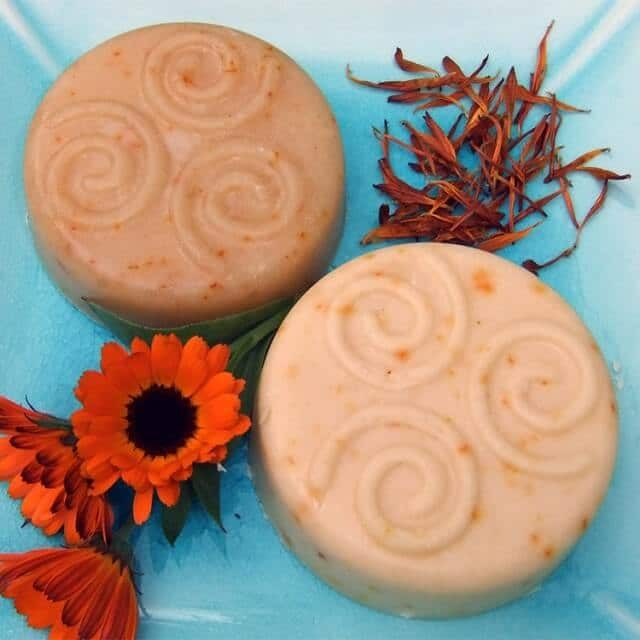 Dried calendula petals can be used freely when making soap. 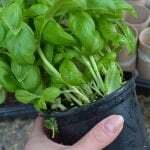 You can stir them in without chopping them up or scatter them on the tops of large loaves as decoration. Because they’re dried, they won’t introduce pockets of moisture inside your bars which might create issues. 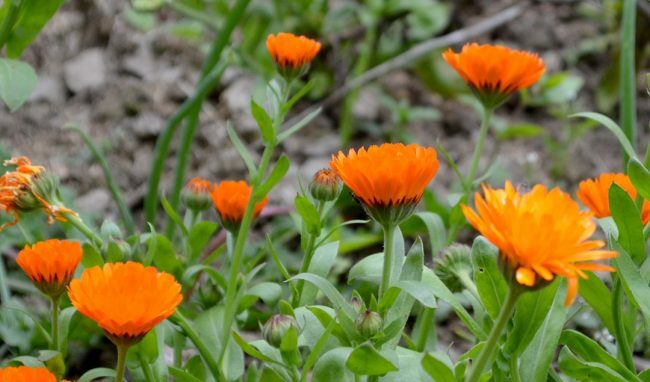 For more on growing calendula to use in soap and skincare products, head over to this piece. 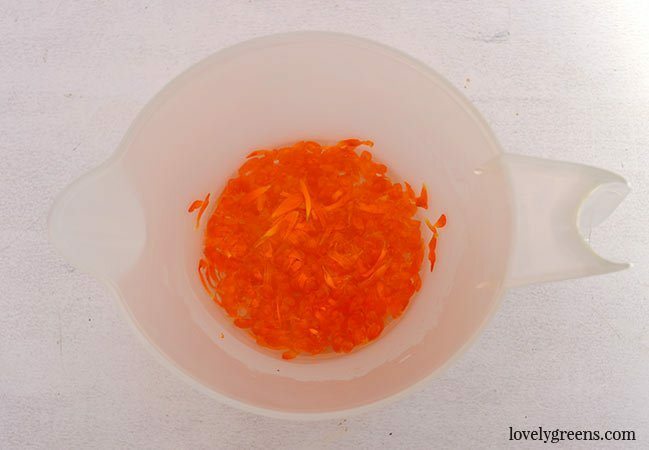 Calendula petals are one of the only flowers that you can blend into cold-process soap and still retain a nice colour. Others such as lavender will turn greenish-brown and rose petals will change from vibrant red and pink to an unattractive rusty brown. Calendula stays bright and colourful. Another reason you’d make calendula soap is that it’s genuinely good for you. Natural components found in the flower are used by herbalists to gently treat skin conditions such as eczema and the healing of wounds and burns. 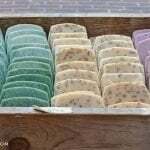 If you’d like to learn more about making natural soap, read through my four-part free soap making series. It includes a background on soap making ingredients, equipment, safety precautions, basic recipes, and the full process of making soap. Continue below for instructions for this recipe. Measure the solid oils into a stainless steel pan dedicated to soap making, the liquid oils into a bowl, the water and sodium hydroxide into heat-proof plastic jugs. 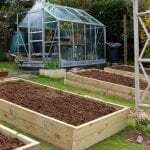 The other ingredients and equipment can be set out at the ready. Now you’re ready to make calendula soap. In a well ventilated area and wearing safety goggles (or onion glasses) and rubber gloves, pour the sodium hydroxide into the water. Hold it away from your face so that you don’t breathe in the steam and stir until it’s all dissolved. There’s a lot of heat and steam let off in this process (yay Chemistry!) so be prepared. Once dissolved, set the jug in cool water so help speed up the cooling of the contents — I usually place mine in the sink. Put the flower petals into the hot lye water now and give it a stir. Put your pan of solid oils on the stove at the lowest setting possible. Stir it gently to help the larger chunks of oil to melt. When the solid oil has completely melted, pour the liquid oils into the pan and stir together. Take the oil’s temperature with your digital thermometer. Also take the temperature of the lye water — ideally, they should be within 10 degrees of one another. 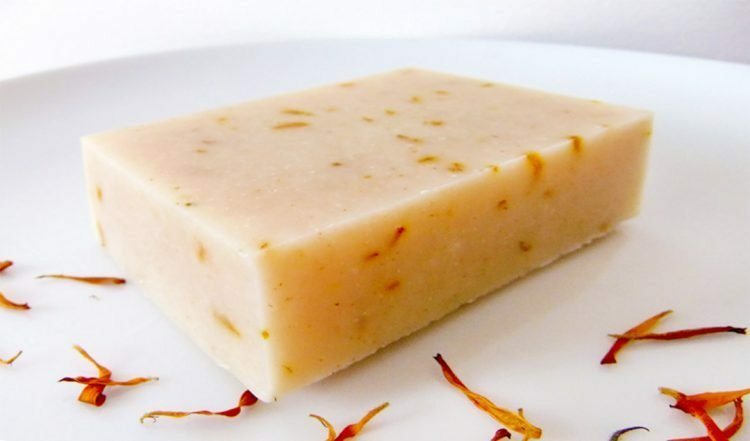 You can create good soap with oils that are between 90-130°F. The warmer the temperature, the darker your final soap is likely to be. When your oil is in this range and you lye water is within 10 degrees of it, it’s time to blend. Pour the calendula infused lye water into the pan of oils, flower petals and all. Now dip your stick (immersion) blender into the pan and while off use it like a spoon to stir the oils and lye water together. Bring the blender to the middle of your pan and at a stand still, turn it on for a few seconds. Stop and then use it (turned off) like a spoon to stir the soap together. Keep doing this until the soap thickens to ‘Trace’. Trace is when your calendula soap batter thickens to the consistency of warm custard. It will leave trails on the surface of your soap if you lift the blender out and let the batter drip down. When your soap is at Trace, it’s time to add the essential oil and grapefruit seed extract. Stir them in well with a spoon or rubber spatula. The soap on the top was insulated after being poured into the mould. The one of the bottom was not. 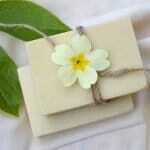 Leave your calendula soap to harden for 24 hours before popping it out of the mould. Afterwards, cut it into bars using a kitchen knife and then set them on baking paper to dry out. 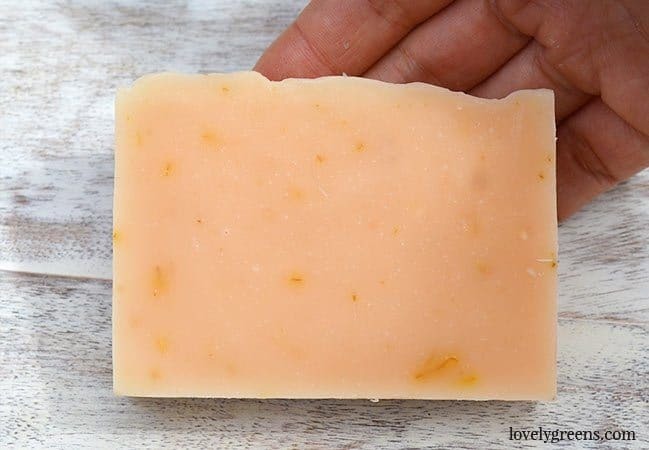 The soap will be completely saponified (fully soap) 48 hours after you make it but your bars need four to six weeks to ‘cure’ before you use them. This is the time it takes for the water to completely evaporate out of the bars. If you use the soap before this time it may disintegrate so please be aware. I enjoyed your video very much!! I have Calendulas is my garden and I love them!! I am hoping to make some Calendula soap for my first grandbaby’s baby shower. I am concerned thought because my patch of Calendulas are planted my a rose bush and the Japanese beetles were so bad this year that I broke down and sprayed my rosebush with Sevin, now I am worried about using the Calendulas for fear that they may be contaminated with chemicals. They did not get directly sprayed with Sevin however, they are vey close to the roses. I look forward to checking out your blog and learning new things, thank you for your time. Dear Tanya, how much water is needed for calendula soap (454g) , 120g in the recipe, but the soapcalc shows 172.9g? Thanks & Regards!!!! Use my recipe — less water means less chance of Soda Ash. I love your website! I am just gathering things to make my first soap. I had calendula petals but needed to preserve, so I put them into olive oil. Can I use that? 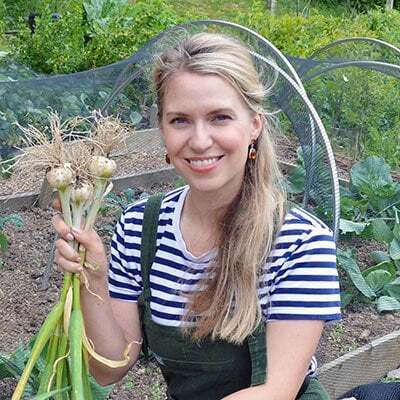 Also your harvesting of flowers on you tube was very helpful! You’re so welcome Susan 🙂 Yes, crack on with using the calendula infused olive oil. 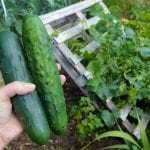 You could also use it to make skin lotions and balms which might even be a better use of it. can this be made into melt and pour? 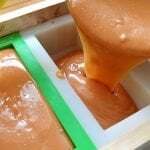 I want to start making soap and Im gonna experiment with melt and pour first just to get the feel of it and start experimenting with different herbs and scents. Im also very impatient and would hate to wait 4-6 weeks until my soap cures to be able to try it out lol.